India, Thailand, Indonesia, Vietnam, Mexico and Ecuador, produce the majority of the farm raised white shrimps. 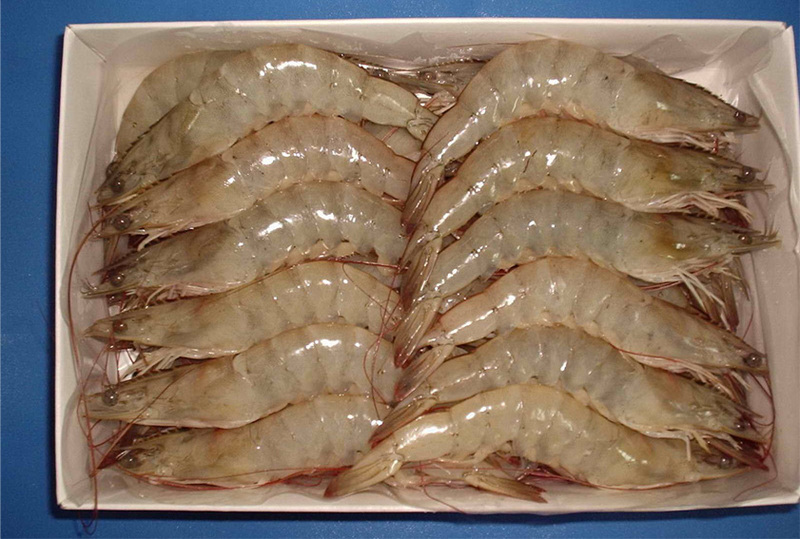 Even though they are called white shrimp their shells are a light grayish-white and turn pink when cooked. The shell can be thinner than wild caught shrimp and, Farm-Raised shrimp will have a mild flavor and sometimes a less firm meat texture, due to the environment they are raised in. Form: HOSO, HLSO, EZ Peel, PND, PDTO & Cooked. Head-On: Head, shell and tailfins on. Headless/Shell-On: Only the head has been removed and the shell and tailfins are still on. Tail On: Headless, peeled & deveined shrimp in which the tail has not been removed. Can be cooked or uncooked. Tail Off: Headless, peeled & deveined shrimp in which the tail has been removed. Only available cooked. P&D: Peeled & deveined, round, tail off. All shell and tailfins have been removed, with segments shallowly slit to the last segment. PUD: Peeled and undeveined. All shell and tailfins have been removed with the segments unslit. Butterflied: The shell and digestive track have been removed and a deep cut has been made that butterflies” the shrimp without splitting it into two pieces.